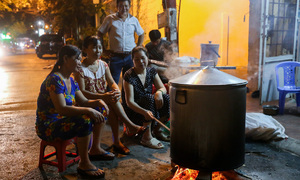 Just before Tet, Ha and her mother are busy preparing a big feast at their house on Kim Hoa Street in Hanoi’s Dong Da District. 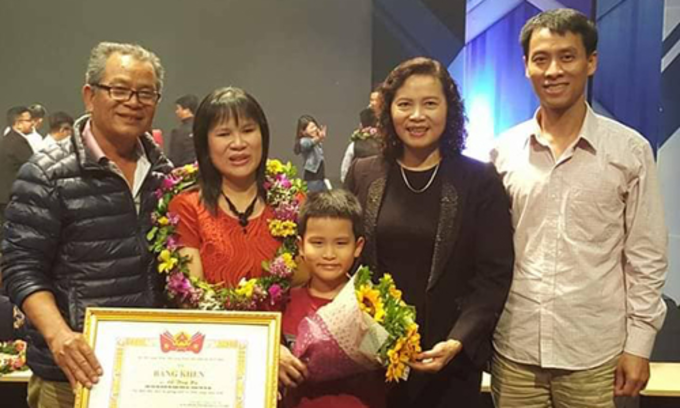 Nguyen Thi Thuy Anh, Ha’s mother, is relieved since her daughter can do many things despite being blind like washing vegetables and cutting meat and rice cakes. But it is hard to believe Ha, 38, is visually impaired, if one were to see her dexterity and liveliness and clear eyes nestling under black lashes. She says with a smile: "The authorities came to check the license one time when I was running an acupressure and massage shop. They saw I could do all the chores quickly and correctly and give them any document they required, and someone in the group suspected my blindness was fake." Guests coming for a massage would think at first the shop owner was normal. Only when they gave her money would they realize she could not see them. Every time she takes a motorbike taxi and the driver asks her address, she would say: "Don’t worry, when you get close to the house I will know." She knows every turn to her mother's house. One time, some young people brought a bunch of notes and challenged her to count them. She touched each bill and said, "There is VND497,000," leaving them awestruck. 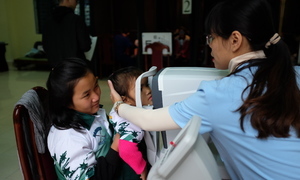 Anh says her daughter’s eyesight began to go at three. The family searched far and wide for a cure, but in vain. 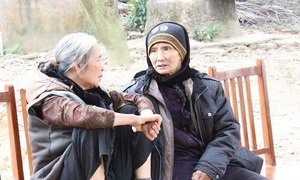 "It was still the subsidy period, and our life was very difficult. "My husband and I had to ask other people to get fish oil with vitamin A for her. However, taking the supplements did not help my child, but caused liver disease. "When she was 10 she could no longer see. The doctors said there was no way to treat it." 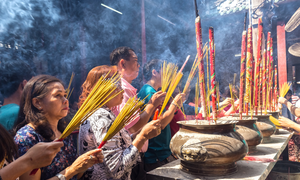 Instead of giving up hope, Anh decided to quit her job and began a new life with her daughter; she took her daughter to Nguyen Dinh Chieu School (for blind children). Every time she cooked or washed dishes in the kitchen, whatever chore it was, she would do it together with her daughter. "Fortunately, Ha is a very resilient and intelligent person. I only need to tell her a couple of times and she can do it by herself." Ha can do housework just like a person with normal vision. Ha says: "Unable to see with my eyes, I have to arrange everything neatly and make use of all the other senses. I observe with my hands, focusing on listening and my sense of smell. I remind myself that I have to try 10 times, 100 times harder than a normal person." She got married in 2011. 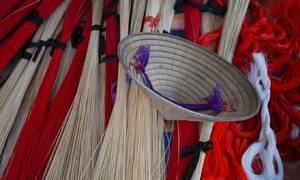 Initially her parents-in-law did not like the marriage, but their attitude changed after they saw her deftness and resourcefulness. When she was pregnant, she equipped herself with all the necessary information and skills. To make formula for her child, she practiced pouring water into the bottle, listening carefully to measure the water level. After scalding her fingers many times with the hot water, she learned how to mix the milk. "With the baby, I did not allow myself to make mistakes. I am very proud I have never left the bed sheet dirty or hurt my baby." 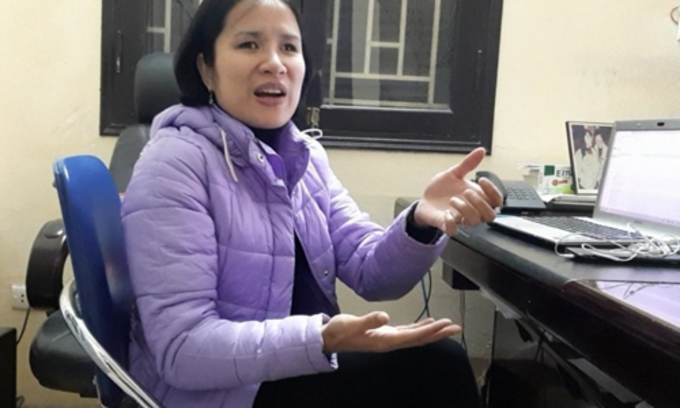 Do Ngoc Anh, 45, Ha’s husband, works in the telecom industry, says: "I fell in love with her intelligence, keenness, deftness and resilience. Ha takes care of our family as well as a normal wife." 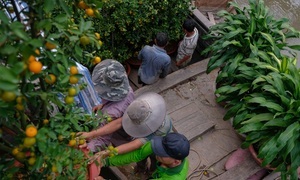 Though they move out of the apartment on Trang Thi Street two years ago, her old neighbors still recall her with affection and respect. 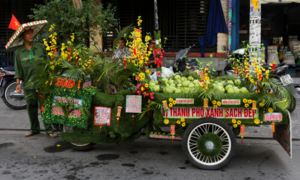 Nguyen Van Muon, who lives close by, says: "Ha is more sophisticated than a normal person. Hearing my footsteps from far away, she would know I was coming home from work and greet me. She is excellent at both English and Japanese. She could teach her child very well. Sometimes I would see her playing an instrument and teaching foreign languages to her child and neighbors’ children." Muon's wife says she did not even know at first Ha was blind because she saw her work completely normally. "Once I went past her house and it was dark but she was cooking in the kitchen without turning on the lights. When I told her Ha turned on the lights, and so I didn't give it much thought. "It was not until I saw her husband holding her hand on the street and asked him did I know she was blind." If what she does at home is merely surprising, what she has achieved outside is nothing short of astonishing. In 2000 Ha was the only blind person to compete in the English Olympic Games in northern Vietnam and ended up winning the third prize. Four years later she got admitted to the Hanoi Open University. After studying for a year, Ha became one of seven people in the Asia - Pacific to get a scholarship in Japan. For two years she lived alone in Japan and studied and even taught herself Japanese from English. Now she is both chairwoman of the Dong Da District Blind Association and studying for a master's degree in business administration at the University of Commerce. The programme is entirely in English. Despite her generally positive mien, she sometimes feels sad about her disability. For instance, her friends can buy and drive a car, but not her. "When they are 4 or 5 years old, children are led by their parents when they cross the street, but my son has to take his mother across the street. "He has had to become more mature since he has a blind mother."